And the queer-baiting continues… . As many of us already saw coming, this season of Hibike! also didn’t magically reveal our two main girls as the raging lesbians we all see them as. Well, some of you already stayed away from this season exactly because you already knew that KyoAni wouldn’t give us what we really want, though, despite the fact that it turned out just as expected, I can’t say I regret watching this even one bit. 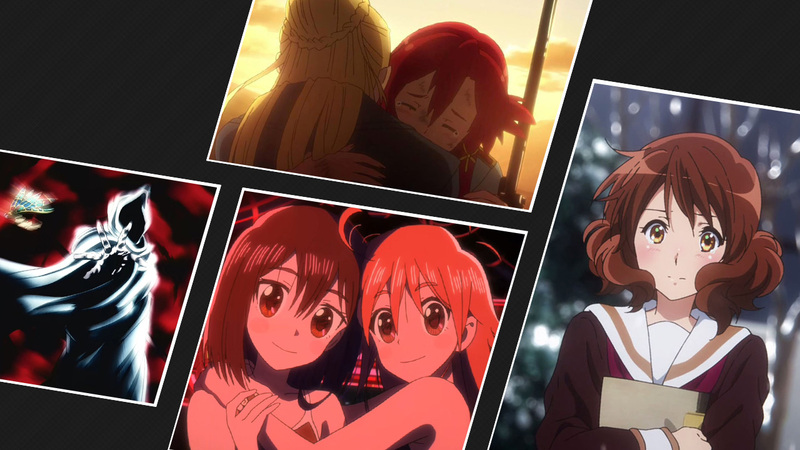 The gay moments between Reina and Kumiko (and later even between a surprising other pair) were as strong as ever, and no matter what Reina might feel for Taki, her feelings for Kumiko came off much stronger than anything she might feel for him. So in my eyes, especially Reina is still very oblivious to her own feelings. Yup, that must be true! As already explained in my full review of this show, I loved it with all of my heart. Finé and Izetta make the most adorably cute pairing of all of 2016, and despite the fact that this show, of course, doesn’t make their relationship clear to the viewers, I think looking at the picture above might as well be enough to get an idea of how close those two actually are. 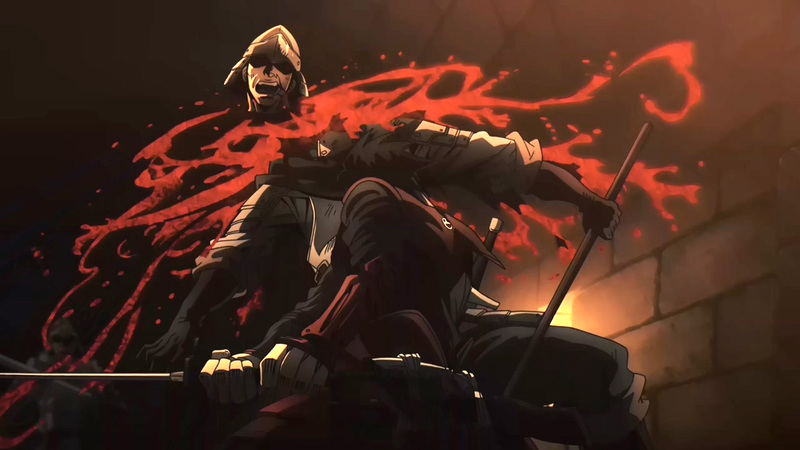 After the first episode, Drifters was an anime that looked promising, and now having finished the season, I have to say that it turned out quite well. Probably the biggest draw of this show was the action—and even though I could have used some more of it—it was visceral and every bit as satisfying as I’d hoped for. The story was interesting as well, these two opposing factions, Drifters and Ends (composed of various historical and military figures), doing battle against each other, but the lack of resolution was a big letdown for me. Also, you have villains like Rasputin, Joan of Arc, and Gilles de Rais, yet you spend so much time fighting ordinary soldiers?! That was disappointing as well. On the bright side, getting a second season is pretty awesome, and it seems like there’s still plenty of room for improvement. One last thing, I hope we get many more legendary characters that join the fray. I’m not a history buff or anything—and I had to google several characters to learn who they are—but I guess you can say that I learned a thing or two by watching this show. Who says that TV rots your brain?! I don’t think I even watched the PVs for this show, so imagine my surprise when this became the most yuri-centric (full-length) anime of the year. I think some people would agree with me when I say that yuri (and yuri-ish) anime has gotten stale. There’s been a lack of originality, but that’s not the case at all with Flip Flappers. Looking past the stellar animation and surreality of it all, you have an anime that’s surprisingly deep and handles adolescence and self-discovery in a way that’s not the easiest to understand, but if you do, it’s very gratifying. Cocona and Papika were a pretty great pairing that had to go through a lot of obstacles, but once they found their way to each other, they were magical together. Yeah, it was at times strange, slow-moving, and a little confusing, yet everything came together really well, and it’s nice to see that taking risks sometimes does pay off. Shows dropped: Brave Witches, Idol Memories, Lostorage Incited WIXOSS, Okusama ga Seitokaichou!+! 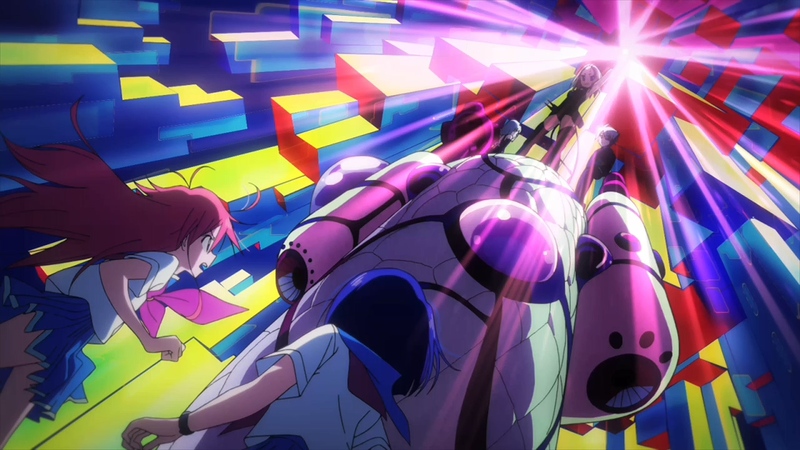 This entry was posted in Anime, Final Thoughts and tagged Flip Flappers, Hibike! Euphonium, Shuumatsu no Izetta by Rock The Vogt. Bookmark the permalink. I agree, Flip Flappers and Izetta were really enjoyable this season. Brave Witches I thought was enjoyable when I just wanted to kick back and not think. You forgot the Show by Rock!! my friend. It’s quite cool, I strongly recommend Show by Rock!! and Flip Flapper to every yuri otaku around the world for this season. Coming up next, the Maid Dragon btw. I saw the first season, but didn’t think there was enough Cyan x Retoree and doubted season two would have any/much more. Maybe I was wrong about that? Yeeeees Flip Flappers! This was 100% my favorite this season [Which I originally thought would be Mahou Shoujo Ikusei Keikaku. Oh, btw, there’s a 100% confirmed yuri pair in there. They don’t get a lot of screen time really, maybe an episode or so worth. But it’s nice. Just be warned, this show is NOT as cute and happy as it seems]. Like dang you can’t tell me those two aren’t in love tho. And you can’t tell me that Yayaka isn’t clearly jealous because she ALSO loves Cocona. She didn’t care when Cocona interacted with ANYONE else. Senpai? Nah. All their other friends? Whatevs. Papika? OH GOD SHE’S GONNA TAKE MY LILY AWAY! Yeah, no, sorry, this anime is SUPER gay.